Thomas Frank, who we featured many posts ago as the author of THE WRECKING CREW, a frontal assault on the Republican and Conservative dismantling of much of the liberal infrastructure in Ideas, Politics, and Government Policy Programs starting in the Reagan years, has come out with a new book. It is LISTEN, LIBERAL!, an equally pointed, though less damning, skewering of how the Democratic Party– post-Johnson, post-Carter– has been increasingly identified with Big Money, meritocracy (rule of a professional elite, privileged, though often from less privileged origins). This meritocracy and need to depend on big donors, banks, “High Finance,” etc., does not sufficiently have the interests of the hard pressed middle class, lower middle class, working class, poor, in mind. Ditto unions. He surely does not equate the sins of Democrats with those of Republicans, but he does achieve a sort of balance by shaking up their privileged position, and their shared responsibility for the flaws of Free Trade, “welfare reform,” rampant prison building, etc. He does say some good intentions morphing into Untended Consequences, many dire for, especially, the bottom 60% (well over 200 million people!) of the population economically/numerically. The Democrats would be well advised, and this is a good year to do it as the Republican train-wreck finally unfolds, go consider these charges by Frank. One would hope that if Hillary Clinton is the Democratic nominee (super-likely) and she is being “educated” or “reeducated” by her opponent Sen. Bernard Sanders, and non-candidate influential like Sen. Warren and former Labor Secretary Robert Reich, she will also give this book a close read. Let’s send her a copy just to make sure. A flaw I’ve detected in the Frank book, not big, but not small either, is his seeming belief in the power of individual politicians to ignore their “times, the public mood, the Zeitgeist, the fact that they sit on top of an evolving structure that conditions their need to respond to Money, the need to have plenty of it to win. Still this does not excuse the elitism and freq1uent tone-deafness to large numbers of voters– some lured by Trump– who are being evicted, figuring out the well intended Affordable [Health]Care Act, struggling with the long term flatness of wages and declining benefits. The WASHINGTON POST, no progressive beacon as in former years, has done a light fact check on the MAR 10 GOP debate. I would like to add some deeper problems with Republican arguments, but wanted to get this 12 point moderate right newspaper commentary out quickly. 1. The media seem young and fairly ahistorical and uninformed in their questions and follow-ups. 2. When discussing things like “Saving Social Security”, really creative ideas are not even on the table. Rubio complains that the program will implode in 20 years if drastic measures like raising the retirement age on younger citizens to 68 (his cohort) from the present 66 yrs and to 70 for HIS children’s cohort. WOW! He would leave present retirees– who will mostly die off in the next 20 years, to enjoy social security unmolested. What never gets put on the table in “saving social security” is the idea of a means test for receiving benefits OR taking the cap off of social security tax. At present all Americans 62 or older, regardless of income can get social security, the standard age is 66, and the required age is 70. You can have an average lifetime annual income of $25,000 a year and get the maximum benefit (around $2400 a month give or take) or you can have an income of $250,000 a year and get this same benefit of $2400 a month. Also if you make, say, $400,000 a year, your MAXIMUM social security tax is $106,000. If you make $400 Million a year (1000 x as much) your maximum is also $106,000. Fair? Rising the social security maximum withholding proportional to earnings on the top 10% as well as everybody else could bring in billions of additional money to shore up the program. This will not happen. Much less a means test, in which those with annual incomes post retirement of over, say, $300,000, would forfeit, say 1/2 of their Social Security. This would be political kryptonite in the post Reagan era. Only Bernard Sanders would touch it. So then, hmmm, the solution is not to tax the 10% richest with 45% of the nation’s disposable income more for social security to “save the program.” Naw. The solution for the Rubio’s. et/ al. would be to bravely raise the retirement age on All, 40 year olds (today) to 68, and 25 year olds to 70. Wage earners would thus work longer and keep SS solvent. The 1 % who have 20% of the nation’s disposable income would keep their hard earned SS checks, retiring at 62, 66 or 70 as they please. CNN aired the 12th GOP presidential debate on March 10, a prime-time event starring the four remaining aspirants for the Republican nomination. Not every candidate uttered statements that are easily fact checked, but the following is a list of 16 suspicious or interesting claims. As is our practice, we do not award Pinocchios when we do a roundup of facts in debates. Common Core is “education through Washington, D.C.
Trump continues to say Common Core is flawed because it is a federally run program enacted from Washington, imposed on local governments. But it has been, and still is, a state-led effort where governors and school chiefs set the standards. It has been a state-led effort, and states have opted into adopting the standards. Get the best analysis of the presidential race. There was something revealing during Thursday night’s debate: When moderator Jake Tapper pushed back, Trump agreed that Common Core is, indeed, a state-led effort. But it’s been “taken over by Washington,” Trump continued, and is a “disaster.” But the federal government didn’t “take over” Common Core. It remains a state-led program. States revise the standards to fit their state, and then allow state and local school districts to shape the curriculums for themselves. And in December, Congress actually took measures to scale back the federal government’s power when it comes to local governments. This federal education law explicitly states that the federal government can’t influence local decisions about academic standards, according to our colleague Lyndsey Layton. More than 40 states and the District of Columbia have adopted the Common Core K-12 academic standards in math and reading. There were 250 tech workers at Walt Disney World who lost their jobs afterthe company allegedly replaced them with foreign workers with temporary H-1B visas. Two workers, Leo Perrero and Dena Moore, have filed lawsuits in federal court seeking class-action status. Perrero and Moore have endorsed Trump, but it would be wrong to suggest that all of the Disney workers have endorsed Trump. Kasich likes to make this claim, but it really overstates the role of the Congress in which he served. Kasich actually voted against two big deficit-reduction deals advanced by Presidents George H.W. Bush and Bill Clinton in 1990 and 1993, which raised taxes and helped set the stage for the dramatic increases in revenue that eliminated the budget deficit. But even those deals were not intended to achieve balanced budgets. When Republicans took control of Congress in 1994 — and Kasich became chairman of the Budget Committee — they did put the notion of a balanced budget on the policy agenda. But Washington also got lucky because there were economic forces that had little to do with either Democrats or Republicans: A gusher of tax revenue emerged, primarily from capital-gains taxes, because of the run-up in the stock market, as well as taxes paid on stock options earned by technology executives. From 1992 to 1997, the Congressional Budget Office estimated, tax revenue increased at an annual average of 7.7 percent in nominal terms, or about 2.4 percentage points faster than the growth of the gross domestic product, the broadest measure of the economy. CBO Deputy Director James L. Blum in 1998 attributed only one percentage point of that extra tax revenue to the 1993 budget deal. The rest, he said, came from capital gains. Between 1994 and 1999, realized capital gains nearly quadrupled, the CBO concluded, with taxes on those gains accounting for about 30 percent of the increased growth of individual income tax liabilities relative to the growth of GDP. There were other factors as well, such as lower-than-expected health costs that reduced an expected drain on the budget. Bush also had kicked in motion a huge decline in defense spending (which Clinton accelerated) and also had overseen a painful restructuring of the banking industry. Even a potential shock, such as the Asian financial crisis in 1997, brought the silver lining of lower oil prices that bolstered the U.S. economy. Actually, Cruz has not changed his view on the ethanol mandate; he consistently has opposed it. Many have criticized Cruz for flip-flopping because he initially supported ending the program in 2020, then told Iowa voters he supports a gradual phase-out of the program with ultimate repeal by 2022. Since 2014, Cruz hasproposed a five-year phase-out of the federal renewable-fuel mandate, which sets the minimum amount of corn-based ethanol to be mixed into gasoline to reduce or replace the amount of fossil fuel. But Cruz had not specified when the phase-out would begin. Now, he says he wants it to start in 2017, his first year as president if elected. The phase-out would be completed with an ultimate repeal by 2022. This is wrong. The gross domestic product — the broadest measure of the economy — increased at a rate of 1 percent in the fourth quarter of 2015 and 2 percent in the third quarter, according to the Bureau of Economic Analysis. That’s not great, but it’s better than zero. Trump is way out of date here. China has been spending hundreds of billions of dollars in recent months — $90 billion in January alone — to prop up the value of its currency as its economy slows. The Japanese yen is also very strong, and with brief exceptions, Japan has not intervened to devalue its currency since 2004. Rubio is off the mark, and overstates the 83 percent figure by nearly 20 percentage points. Medicare, Medicaid, interest on the debt and Social Security are estimated to take up 61 percent of the spending by 2022, and 65 percent by 2026,according to the Committee for a Responsible Federal Budget’s analysis of the Congressional Budget Office projections. When you include all mandatory spending programs, the share would be 75 percent in 2022. Rubio’s estimates would have been more accurate if he were talking about the share of spending growth going to such budget items over the next five years, according to CRFB. Total spending on Social Security, Medicare, Medicaid and interest will account for 83 percent of the growth in spending ($1 trillion of $1.2 trillion), CRFB says. Kasich appears to be citing a statistic touted by a group known as Trade Benefits America, a coalition of business groups. It’s not entirely clear from the group’s website how this figure was calculated, but one should generally take a jaundiced view of claims made by trade groups. Notably, a 50-page White House report issued in 2015 to tout the benefits of trade did not make such sweeping job claims. This used to be a staple claim during GOP debates that went away for a few debates, but it returned thanks to Rubio. This zombie claim about the shrinking Navy just won’t go away. Fact checkers have repeatedly debunked this Three Pinocchio claim in the 2012 presidential elections. The current number of ships in the Navy is 272. It is the lowest count since 1916, when there were 245 ships. A lot has changed in 100 years, including the need and capacity of ships. After all, it’s a now a matter of modern nuclear-powered fleet carriers, versus gunboats and small warships of 100 years ago. The push for ships under the Reagan era (to build the Navy up to 600-ship levels) no longer exists, and ships from that era are now retiring. There are other ways to measure seapower than just the sheer number of ships, according to Navy Secretary Ray Mabus: “That’s pretty irrelevant. We also have fewer telegraph machines than we did in World War I and we seem to be doing fine without that.… Look at the capability. Look at the missions that we do.” Plus, the Navy is on track to grow to just over 300 ships, approximately the size that a bipartisan congressional panel has recommended for the current Navy. The Fact Checker in 2013 looked closely at whether the fatwa actually was issued, and determined the evidence for it is rather fuzzy. It appeared to exist mainly as part of Iran’s diplomatic portfolio to insist its nuclear ambitions were innocent in nature. In any case, the international agreement on Iran’s nuclear program has, at least for the moment, halted and reduced the scale of the program. Moreover, Khamenei has not threatened to use nuclear weapons against the United States. Trump exaggerates a horrific practice by the terrorist group known as ISIS. The group in 2015 released a seven-minute video that showed a cage with five men being drowned. The graphic video, which is very difficult to watch, depicted punishments by drowning, grenade launcher and explosive cables tied around prisoner’ necks. The section on the cage drownings used underwater cameras that purported to show the men thrashing around until they lost consciousness. Rubio does not often get credit for this, as he was not a member of the Senate Committee on Veterans’ Affairs. But he did, indeed, introduce legislation in February 2014 to give the secretary of the Department of Veterans Affairs authority to fire or demote senior managers for incompetence or misconduct. Florida was one of the states where early reports of mismanagement within the VA surfaced, prior to the high-profile scandal that erupted in April 2014. Rubio and Rep. Jeff Miller (R-Fla.), chairman of the House Committee on Veterans’ Affairs, had worked on giving then-VA Secretary Eric Shinseki this authority since early 2014. The bill ultimately was included in the larger legislation that Congress passed later in 2014 to overhaul the VA. Rubio was on a bipartisan House-Senate conference committee that negotiated the broader VA bill. This is a complicated tale, but Cruz really overstates the case. We had previously given him two Pinocchios for this line. The Winston Churchill bust in question was originally provided in July 2001 by then-Prime Minister Tony Blair as a loan to President George W. Bush. The bust, now about 70 years old, was made by English sculptor Sir Jacob Epstein, and Bush said he would keep it in the Oval Office. Various news reports at the time said the bust would be returned once Bush left office. When Obama took office, the Epstein bust loaned by Blair was returned to the British government, and the U.K. ambassador installed it in his residence. According to a 2010 interview with White House curator William Allman, the decision to return the bust was made even before Obama arrived, as the loan was scheduled to last only as long as Bush’s presidency. But the British press, always eager for any sign of rockiness in the U.S.-British relationship, had a field day with the return of the bust. There is no evidence that Obama personally decided to return the bust; given the economic crisis at the time, one imagines he had bigger issues on his mind. Perhaps someone on his staff should have recognized the symbolic value in retaining the bust, but the odds are the machinery of the transition just moved forward on its own. Cruz, without evidence, states that this was clearly Obama’s decision — “within the opening weeks” — and then imbues great significance to that fact. But he’s really creating a mountain out of a molehill. Trump continues to assert that he’s “self-funding” his campaign, but that’s not correct. Anyone who goes to donaldjtrump.com will see the “Donate” button prominently featured on his home page. Trump has provided the majority of funds raised by the campaign committee so far. Of the $25.5 million raised as of Jan. 31, 2016, 70 percent ($17.8 million) was money from Trump. At least $12.6 million of that was a loan from Trump to his campaign. The rest came from mostly individual contributions, according to the most recent Federal Elections Commission data maintained by the Center for Responsive Politics. While Trump says most of the contributions that came from other donors are in smaller amounts, 1,911 donors gave between $200 and $2,700, data show. As of Feb. 22, 2016, outside groups had contributed $1.9 million to the Trump campaign. As for polling for general election matchups, it’s unclear just how many is “many” to Trump. But most general election polls show Trump losing to Clinton. And it’s not just Clinton; her rival, Sen. Bernie Sanders (Vt.), also beats Trump in most general election matchups, according to a list of election polling maintained by RealClearPolitics.com. Trump falsely claimed that the requirement to have 1,237 delegates to win the Republican presidential number is a “random number.” He’s wrong. There are 2,472 total delegates to the convention, so the number is a simple majority — 50 percent (1,236), plus 1. Is it maybe too early to start the victory war dance? It has never looked better for the Democrats but History has already thrown a number of spitballs into this election. Watch out! Republican elites wanted an appealing alternative to Trump, But they now face the prospect of a race between an unsettling billionaire and a scary senator. The only prospect more daunting to savvy Republicans than that of a November ticket headed by Donald Trump is that of a November ticket headed by Ted Cruz. Every bit as extreme as Trump on the issues, equally combative and at least as ethically challenged, Cruz is Trump with an extra helping of meanness. So unappealing is the prospect of Cruz as the party’s nominee that there has long been a quiet consensus among Republican and Democratic strategists that the selection of the Texas senator as the party’s standard-bearer could lead to a Democratic landslide in the fall. Cruz is Trump with an extra helping of meanness. Since January, the threat posed by Trump has become increasingly unsettling to GOP leaders — and the great mass of Americans. And recent days has seen an aggressive effort to block the billionaire. The hope was that political careerist Marco Rubio, the Florida senator who has never shown any penchant for saying “no” to campaign donors or corporate lobbyists, would somehow gain traction. Unfortunately for the GOP insiders who cannot seem to catch a break this election year, “Super Saturday” was super for Ted Cruz. The Texan swept the Kansas an Maine caucuses Saturday, and came within five points of beating Trump in the Kentucky caucuses and the Louisiana primary. Though Trump claimed it was a huge night for him, Cruz won more delegates on “Super Saturday” — taking 62 to 49 for the billionaire. And what of Rubio? He finished a weak third in Kansas, Kentucky and Louisiana. And in Maine he was in fourth place, trailing behind the only serious (and thus most marginalized) candidate left in the Republican race: Ohio Governor John Kasich. 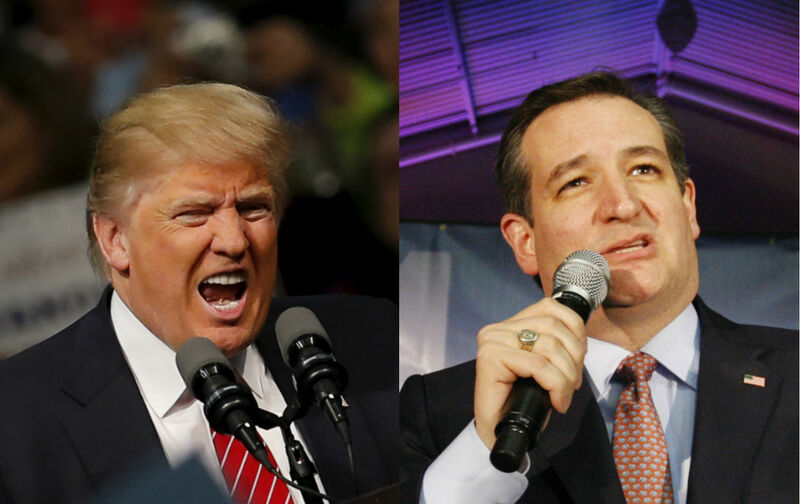 The nightmare scenario of a Trump-Cruz race is now looking more likely than ever. Republican leaders have to be asking: How did the party of Abraham Lincoln, Teddy Roosevelt and Dwight Eisenhower end up faced with the choice between a narcissistic billionaire who keeps saying awful things and a narcissistic senator who keeps doing awful things? If the Republican elites who stopped listening long ago to their better angels really want an answer to that question, of course, they need only they look in the mirror.